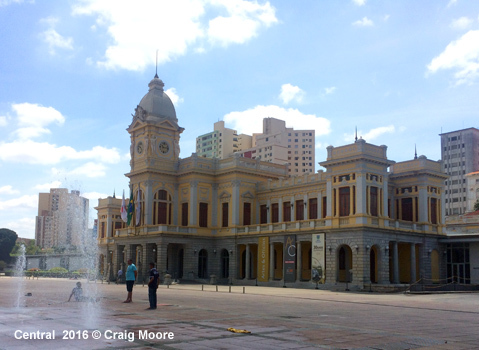 The metropolitan area of Belo Horizonte, in the Brazilian state of Minas Gerais, has a population of about 5 million. Construction of a mainly surface metro started in 1981. 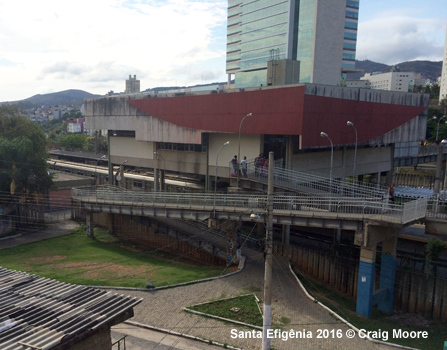 The first line was planned from Eldorado in the west to São Gabriel in the north of the city centre. It would be 23.5 km long and have 16 stations. 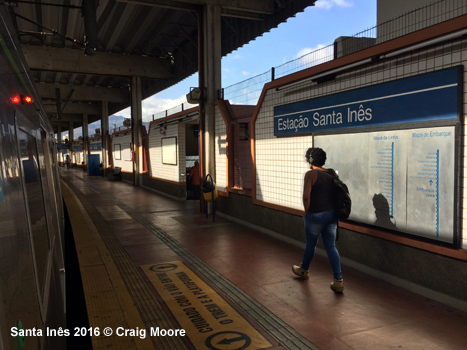 In 1987 construction work came to a halt due to financial problems and only a 12.5 km stretch with 7 station was put into service between Eldorado and Central. 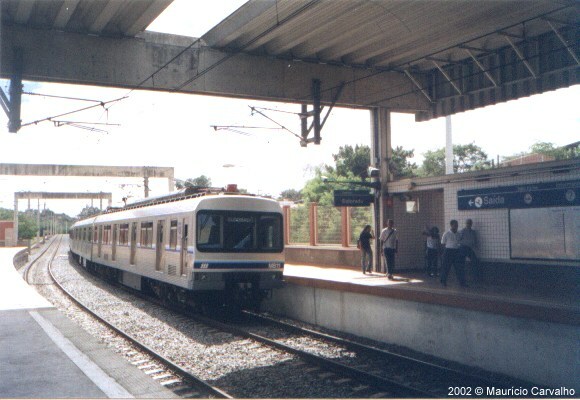 Construction was resumed in 1991 and eventually reached Vilarinho in 2002. 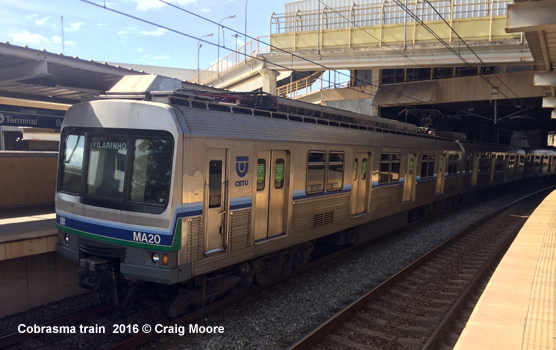 It now has a total length of 28.2 km with 19 stations. 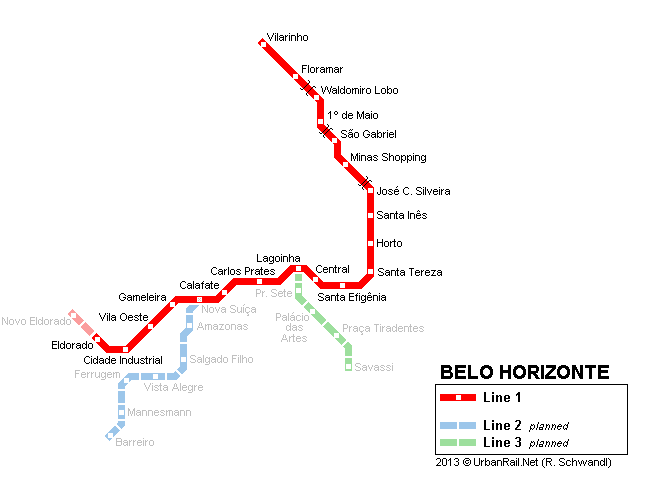 Line 2 will branch off the first line at a new station called Nova Suíça (between Calafate and Gameleira) and run towards the southwest to Barreiro. 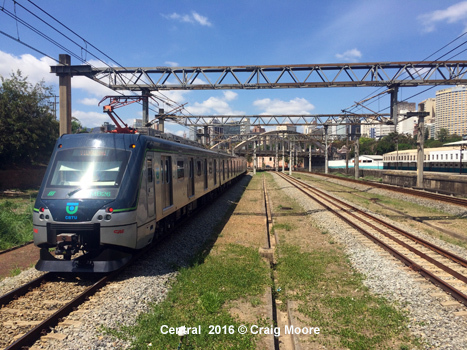 It will be 10 km long and have 7 stations. Construction started in 1998 but was suspended in 2004; it is now scheduled to resume construction in 2014. 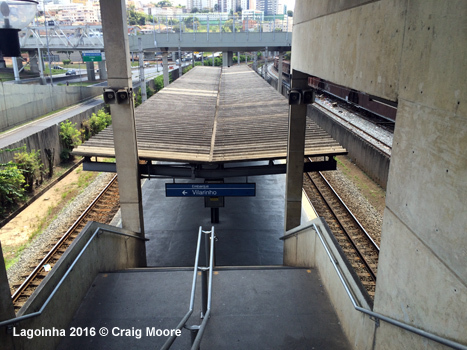 At the same time, a first section of Line 3 will be built from Lagoinha to Savassi. 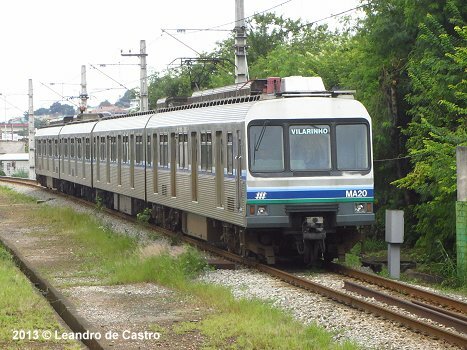 In the long run, Line 1 could be extended at both ends, north to Ribeirão das Neves and west to Betim, Line 2 towards the city centre to the hospital area, and Line 3 should run north to Pampulha (airport). 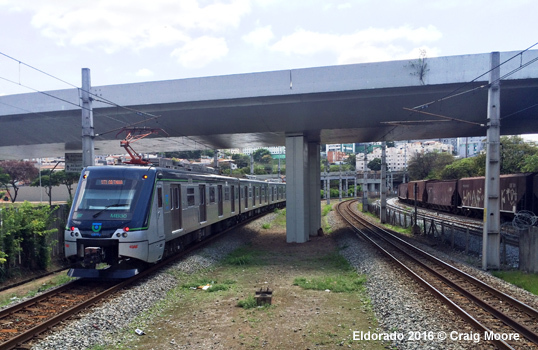 The Belo Horizonte Metro runs from the Eldorado area located outside the city boundary in the west to the northern suburb of Vilarinho. The line meanders quite a lot, especially in the central area, running parallel to a dual-gauged freight line through the city as far as Horta, from where the Metro line heads north. The 28.1km route has 19 stations and takes 44mins to travel, providing some lovely views of the city and the distant mountains which form the ‘Beautiful Horizon’ beyond. The line is mainly at grade but there is some elevation at Eldorado and Floramar. 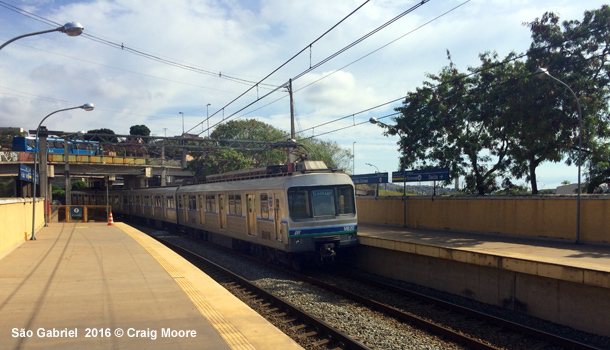 It uses 1600 gauge as is the norm in Brazil, with overhead supply and services run from 0515-2300 with 10min base headways (4-6min at peak times). The system is basic in many ways. There is a barren feel to the infrastructure. 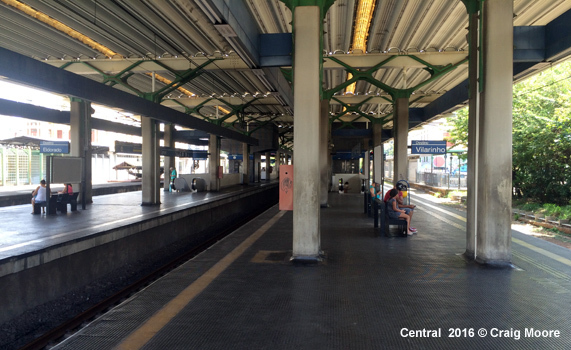 The stations in the central area and to the west are quite rudimentary, with simple concrete structures, often overbuilt and with a mass of empty space. 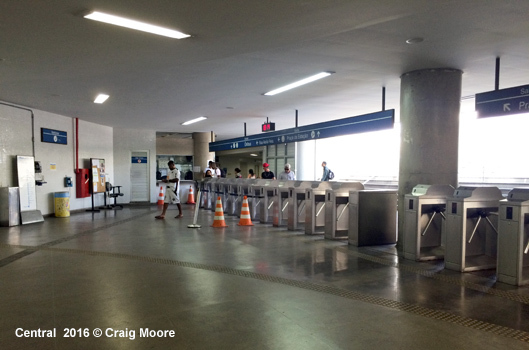 Ticket halls are stark and dark (little natural light), with ticket counters providing paper tickets (R$1.80) (there are no ticket machines) and entrance/exit barriers, whilst platforms (a mix of side and island) are quite tired-looking and are built for 8-car sets, although only 4-car sets are in service. Trains stop at the front of the platform and at Eldorado station, the arriving train heads to the far west of the platform where passengers alight, cleaners come on the train and mop the floor before it then moves to the front of the platform (east) where the passengers heading to the centre then join. Stations in the north tend to be brighter, with wall tiles and these have a more metro feel, as opposed to the suburban rail feel to the stations in the west. 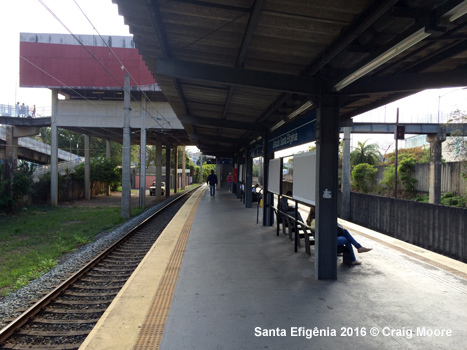 The northern section also has some large station buildings, especially São Gabriel which has physical interconnection with a huge bus hub as part of the busy two line ‘MOVE’ BRT system. 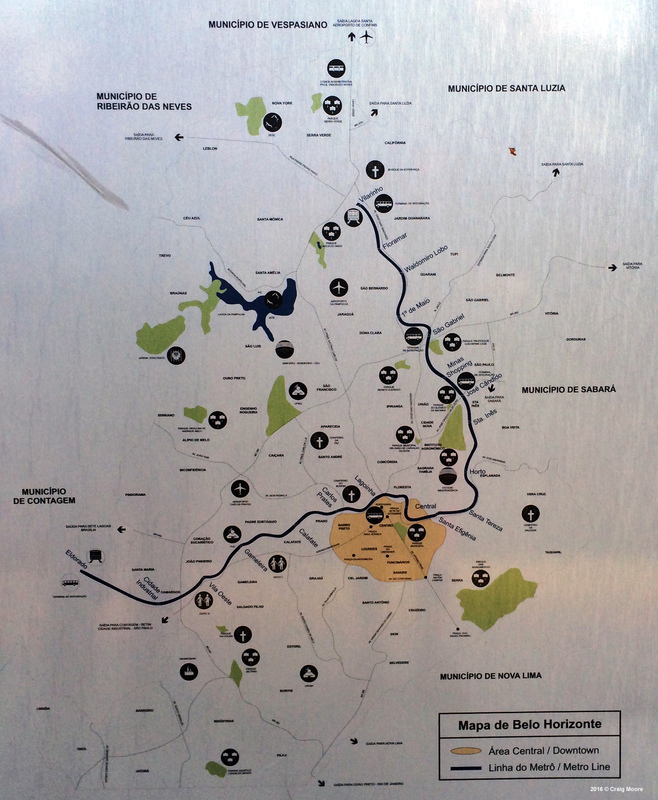 Directional signage is fine as it is a simple one-line system and signs for the destination terminus are clear to see. 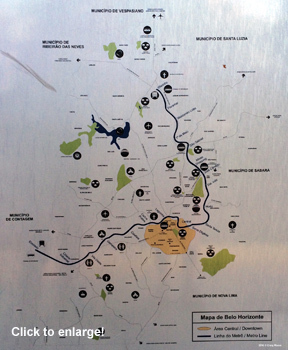 General system information is available in the entrance and on platforms in the shape of a large geographic map and basic line map. Other information such as travel times and start/finish times are available on small information boards attached to the pillars supporting the platform canopy roof. 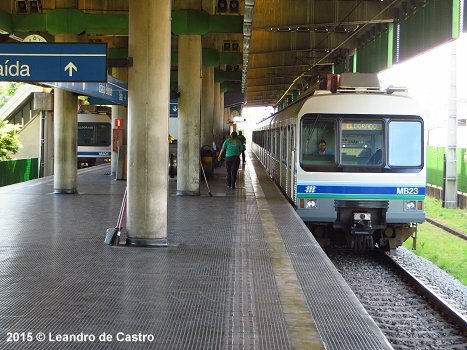 There is no electronic real-time information, nor hard-copy information for passengers and audio announcements (Portuguese) are only offered at some stations. 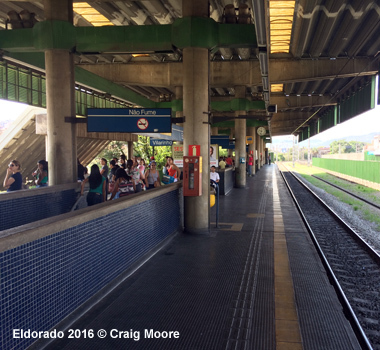 At many stations there was little passenger flow with most movement at just a few stations – Eldorado, Lagoinha, Central, Santa Efigênia, São Gabriel, Waldomiro Lobo (located in a deep cutting) and Vilarinho. 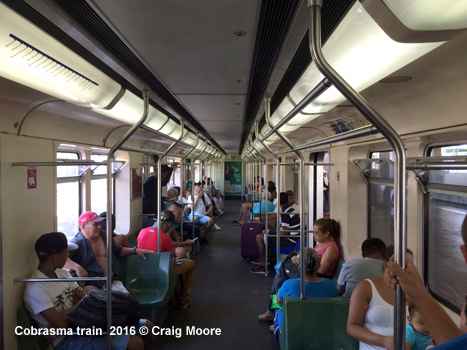 There are two types of stock in use, the older Cobrasma trains are very dated now, with ugly back-lit strip maps, tatty side seating and individual carriages. 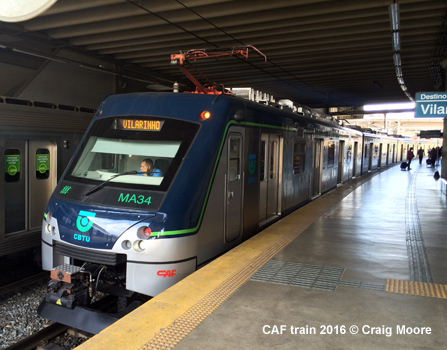 The newer CAF stock (part of a CBTU bulk order from CAF – Recife have the same trains, I believe) is much smarter with electronic strip maps, bright white interiors and TV screens with route information. 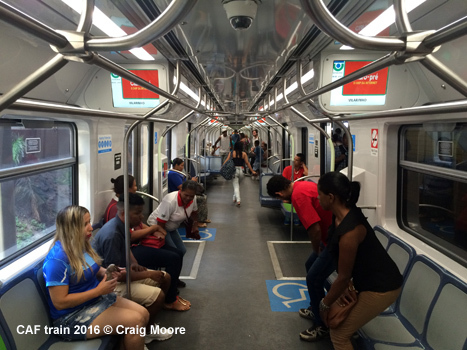 These are also walk-through trains. 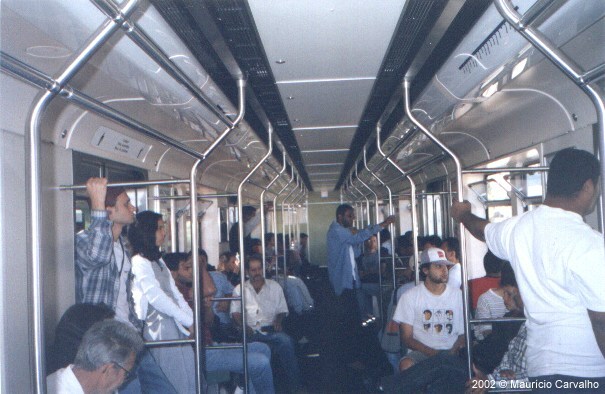 Both types of train operate 4-car sets and have Portuguese audio announcements.